The Grand Unification of Physics. Under Construction—I am making a major new revision—starting on 1/28/2014—it will take weeks. For now, to get to the old web pages, please click on the green "Videos" titles below. This website covers: “What is time?”, the Grand Unification of physics, a fusion energy breakthrough, DOAWGs, a new type of astronomy, spherical electromagnetic waves, & many other interesting topics. Do you think of time as a mystery? Have you ever wondered what time is? If you have, the no-nonsense answer is here. Why go through life without understanding time? If you enjoy thinking about physics, you will enjoy this section. It covers: time, space, grand unification, spherical electromagnetic waves, & many other topics. This new physics leads to many intriguing new ideas in astronomy. If correct, astonomy is headed for big changes. Understanding time & grand unification enabled me to engineer of a new type of fusion energy power plant. The physics explains why previous designs did not work & why these designs will work. NFT is short for Nordberg Fusion Technologies, Inc. This is a planned Research & Development company for developing and licensing my fusion reactor & superconductor patents. This section covers water. A new technology is discussed—Desert Oasification Atmospheric Water Generators (DOAWG). DOAWG collect water in hot deserts & will help solve global warming. This section covers a wide range of other topics. This page has the complete list of links to topics on the history, physics and philosophy of time. Are you in a hurry? Do you want to know what time is, but don't have a lot of it right now. Here you will discover for yourself the short explanation of time. It is simple, easy, and to the point. I understand. Sooner or later, everybody wants to know what time is — but some people are more visual and auditory — they prefer videos. 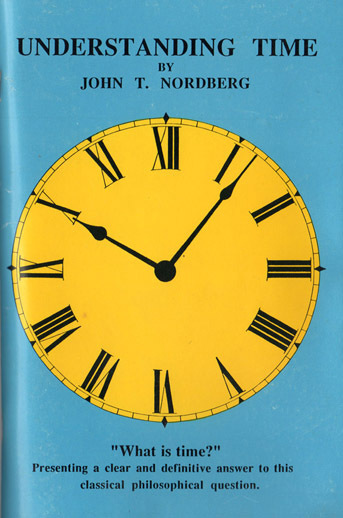 I have authored 3 books on time: What is time? 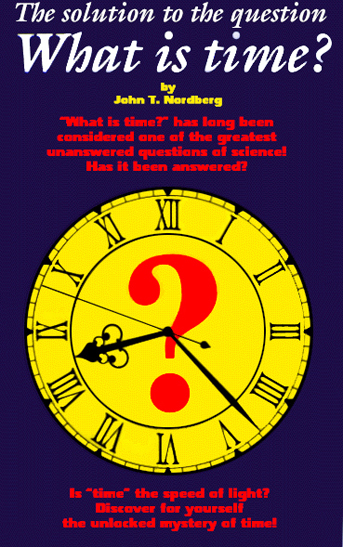 ; The solution to the question, “What is time?”; and an upcoming book, Time and Grand Unification. When it comes to understanding time, understanding a small amount of logic is critical. The key details can be found here. The History of Time? (That is an odd phrase!) A better understanding of time involves understanding the history of time. This is not a complete review of Special Relativity. It is an explanation that is based upon understanding time. The Speed-of-Light Definition of Time is actually a variation of Special Relativity. In Relativity you find the Lorentz Factor everywhere. This bit of math confuses people. An understanding of time makes understanding this bit of math easy. How did I make the breakthrough? It involves showing the geometrical relationship between the Lorentz Factor, Special Relativity, and The Speed-of-Light Definition of Time. The complete list of topics on Grand Unification Theories — “GUTs” for short. They are also called Theories of Everything — “TOEs” for short. An introduction to Grand Unification Theories. The key logic that you need to understand. The key parts of geometry to know. Everyone thinks about “four dimensional space-time.” When you understand time, there is a huge breakthrough in this area. “Absolute” versus “Relative.” Includes: “Absolute Space,” “Rest Mass,” “Absolute Time,” “Absolute Motion,” the Potential Energy of a particle within the Universe, and more. Einstein tried to explain and unify gravity with General Relativity. He tried to weave gravity into space. The Ball-of-Light Particle Model puts it back into the particle were it belongs. A step-by-step explanation of how to think of spherical waves, and how to make spherical waves. Includes decay modes. This table is a complete construction — like “blue prints” — of all the variations of “Balls-of-Light.” How to build: photons, neutrinos, electrons, and other elementary particles. The complete list of topics on physics. In general, there are no long explanations of traditional physics. Topics emphasize problems, controversies, and unified solutions. Explains the building blocks of physics — the Basic Units. How to improve basic units. Covers how to correctly measure lengths, and how to correctly measure motions. Simple, yet critical! Covers the major philosophical, mathematical, and physical ideas you need for understanding space and space-time. Recaps the basic of waves. Expands on the topic by introducing spherical waves. Recaps the basics of electromagnetics. Expands on the topic by explaining magnetic monopoles and unifying gravity. Recaps the basics of Quantum Physics. Clarifies certain topics using the Ball-of-Light Particle Model. Topics on Density: Infinite Density, Maximum Density. This is a very important topic if you are interested in astronomy. Topics on Mass and Matter: the Poynting Vector, Mass Dilation, Gravitational and Inertial Mass. Photons, the Electromagnetic Spectrum, “Thermal Radiation,” “Non-Thermal Radiation,” the “Slowing of Light,” Gravity & Light, induction & absorption of photons from elementary particles. Solitons, Spherical Waves, Platonic Solids, Stellations, Polarizations, Symmetry, Golden Ratio, Primes, Harmonics, Spherical Nodes, Tilings, Spherical Harmonics, the Nature of Charge. The complete list of topics on Astronomy. A recap of current cosmology. Topics covering how understanding time and the Ball-of-Light Particle model affects cosmology. A recap of the current theory of the Big Bang. Topics covering how understanding time and the Ball-of-Light Particle model affects Big Bang Theory. If the Ball-of-Light Particle Model is correct, then the current theory of Galaxy Formation is completely wrong. This is a very interesting topic. If the Ball-of-Light Particle Model is correct, the current theory of star formation — & and the Standard Solar Model — is completely wrong. Includes a new solar model. A very interesting topic. Many topics: solar activity, sunspots, solar satellites, the Solar Neutrino Problem, GONG observations, SOHO observations, and much more. Explaining the extreme temperature of the sun's corona. Solar activity is very interesting. Our sun's solar activity is a function of its wobble — not due to “magnetic reconnection.” However, according to Standard Solar Model, this is impossible. The idea of “Infinite Density” is compared to the idea of “Maximum Density.” Also covers ”Degenerate Matter.” These topics are critical to understanding all major objects in astronomy. If the Ball-of-Light Particle Model is correct, then Quasars are extremely massive balls-of-light — not black holes consuming stars. In essence, they are massive decaying elementary particles. If the Ball-of-Light Particle Model is correct, then Pulsars are balls-of-light with a large spherical electromagnetic wave sweeping back-an-forth over its surface. If so, current pulsar theory is wrong. If the Ball-of-Light Particle Model is correct, then White Dwarfs are very massive balls-of-light ejected from the cores of galaxies — essentially they are massive decaying elementary particles. If the Ball-of-Light Particle Model is correct, then Neutron Stars are examples of balls-of-light with “maximum density.” Essentially, they are “single particles” not a compressed collection of neutrons. If the Ball-of-Light Particle Model is correct, “Black Holes” don't exist. What exists instead are extremely massive elementary particles — left over from the Big Bang! A significantly different theory. If the Ball-of-Light Particle Model is correct, then variable stars are pulsating balls-of-light. This is a very interesting topic that directly relates to engineering nuclear fusion reactors. Introduction to topics on: fusion, nuclear fusion energy, and nuclear fusion power plants. A revised view of how fusion works in stars — based upon the Ball-of-Light Particle Model. A comparison of “Fusion” versus “Fission.” They are very much alike. Fission maybe more common than fusion! An introduction to how spherical waves form in hot fusion plasmas. How these waves can either destroy confinement or be used for confinement. “MHD” stands for “magnetohydrodynamics.” This critical bit of plasmas science shows how fusion energy can be converted directly to electrical energy in a fusion power plant. The “Lawson Criterion” estimates the conditions for successful fusion. Topics include an explanation of how spherical waves can be used dramatically affect the criterion, enabling successful fusion. A list of external links for: fusion, nuclear fusion, fusion energy and fusion power plants. Info on: business plans, research plans, location, contact info, and progress. Fusion Energy is the future energy source for the world. It is clean, unlimited, cheap, and safe. Learn about fusion energy benefits. Information on John Nordberg's fusion and superconductivity patents. Information about State Operating Licenses. These licenses will allow individuals, groups, or companies to make money with John Nordberg's fusion reactor patent. New or existing companies that would like to build John Nordberg's fusion reactor designs will need a Manufacturing License. A team is needed: Board Members, Management, HR, Accounting, Publicist, Graphics, Animation, Web, Lobbyist, Fundraiser, Grant Writer, Office, Finance, Legal, Technicians, Engineers, Physicists. Details of the reactor designs. Variations of designs, blueprints, 3D graphics, animations. Topics include: Nuclear Regulations, Developoments in National and State Politics. Topics include: Nuclear Proliferation, how fusion energy will help developing countries, how fusion energy can change the geopolitics with nations interested in nuclear weapons. What politicians need to know about fusion energy. Proposed changes in laws, regulations, and funding. Money is needed — of course. At this time, an IPO would be premature. Donations, and grants will be the 1st avenue of funding. The 2nd will be licensing. Watch for future info. Business proprosals, a “One Page Proposal,” and Research Proposals. Desalination is expensive an inefficient. There is an alternative. A technology similar to dehumidifiers, but much larger and more efficient can pull massive amounts of water out of the atmosphere. Rain comes from the humidity in the air. The key is a cold front. DOAWGs make a constant cold front, allowing a constant rain in hot, humid conditions. Healthy soil contains large amounts of carbon — e.g., microbes, plant life, animal life, and charcoal. Sterile soil contains little or no carbon. Improper farming releases carbon into the atmosphere. This section explains how Desert Oasification Atmospehric Water Generators work. Tera Preta — or, black earth — is an extremely fertile type of carbon enriched soil in the Amazon basin — made by humans between roughly 2,000 to 1,000 years ago. We neeed to reinvent Tera Preta. Hot and humid deserts can be transformed into grasslands, savannas, farmlands, even tropical rainforest, providing food and animal habitat — and sequestering massive amounts of carbon. DOAWGs need to be tested and optimized. A program is needed in the US. It is recommended that these tests are performed in drought stricken areas of Texas and Oklahoma. The Mega Lake Chad Basin — mainly in Niger, and Chad — would be an ideal area to test DOAWGS. This region could become the breadbasket of Africa — and provide new habitat for endangered species. This section describes a proposed experiment for the Mega Lake Chad Basin. It includes the goals for oasification of certain amounts of the desert. Extracting water from the atmosphere in hot, humid deserts has many benefits. Oasification is obvious. An indirect benefit is how this will extract massive amounts of carbon from the atmosphere. Areas of the American southwest are experiencing long-term drought conditions. The list of related problems is huge. A simple solution for humid areas is implementing DOAWGS. Plant life and microbial soil life act as important water reservoirs. So-called experts of forest fire management are consistently making grave mistakes by destroying these water reservoirs. Help is needed by a wide variety of people with a wide variety of skills. I did not patent DOAWGs. People can build them on their own now. Research is needed. Businesses should be started. There are a large number of topics that did't make it as a main menu topic. This is the catch all location for them. Predicting Earthquakes, Earthquake Watches, Electromagnetic Signals from Fracturing Rock, “Solid Crust Tides,” and an Earthquake Warning System. Energy Info, Renewables, Alternative Energy Sources, the Hydrogen Economy, Energy Sources, Energy Statistics, a Carbon Free Future?, Conservation, Energy Plans, Energy Links, & much more. Prime Numbers, Knot Theory, The Golden Ratio, Spherical Harmonics, “Yang-Mills Mass Gap,” Balls-of-Light as a series function, Platonic Solids, 15 Great Circles on a Sphere, Tiling, Stellations. The Sun influences weather. Predicting long-term weather using solar activity. Hurricanes & Solar Flares. The Maunder Minimum, Ice Ages, Solar Cycles, Long-Term Changes in Gravity. Intro to Ball Lightning, observations of Ball Lightning, “Plasmoids,” Earthquake Signs, Making balls-of-light by fracturing rock, “The Exploding Wire Phenomenon,” and Crop Circles. A list of science articles that John has found interesting. Reviews of science articles by John. Possible religious implications and interpretations of the Ball-of-Light Particle Model. Biographic Information, Press Releases, Interviews, Hobbies, and miscellaneous interests. An index and links to videos. A collection of key images. 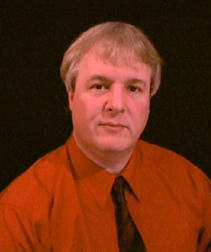 This page will have information about John Nordberg's books. For 2016, John is planning to make an ebook on Time & the Grand Unification of Physics. Hello, my name is John Nordberg. Welcome to my site. It is a very old website going through some growing pains. I hope you enjoy my vision of time, the grand unification of physics, the solution to fusion energy, a new solution for getting fresh water in hot deserts, and a solution to global warming. This 3-dimensional, geometric equation, is the key to unifying physics. Basically, it states that if you take the “cross product x“ of the electric field vector E and the magnetic field vector B, the result is the gravitational field vector G.Do not confuse the gravitational field “vector G“ (it has a small arrow above it) with the Gravitational constant (which is represented by a big "G" without a vector arrow above it) or with gravitational acceleration (which is represented by just a small "g").